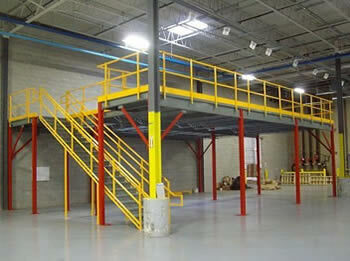 Mezzanines can be designed and configured to overcome a number of storage problems. By building up rather than out, tall systems take advantage of factory space by capturing overhead area that is lighted, heated and paid for, while allowing valuable floor space to be used for more profitable activities. 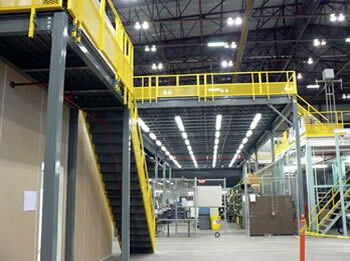 Mezzanines can have many variations depending on shapes, sizes, weight capacity and more. 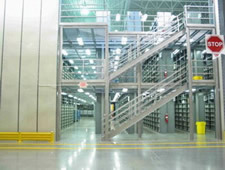 NationWide Shelving’s experts can design and customize the mezzanine to meet your specific needs and adapt to your space. 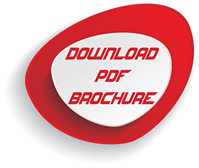 Our experts will do site visits, measure your space, drawings, 3D rendering, and quotes. This is all a FREE, no purchase necessary service that NationWide Shelving provides with ALL of our products. Shelving has the structural integrity to allow for custom design of multi-level installations in countless arrangements. 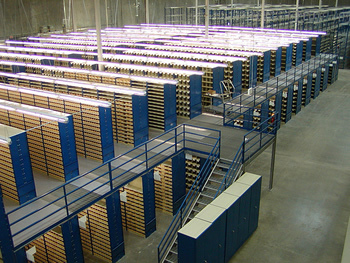 Clip, Rivet, and Wide Span shelving systems with our Pallet Rack works smoothly with our mezzanine storage options. 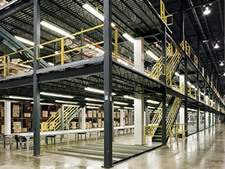 Your NationWide Shelving experts can help you choose the perfect shelving and mezzanine to meet your needs. 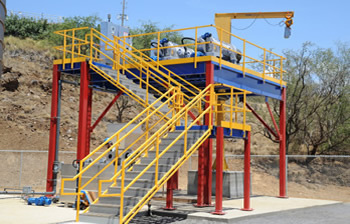 Stairs and landings are available for all mezzanines. 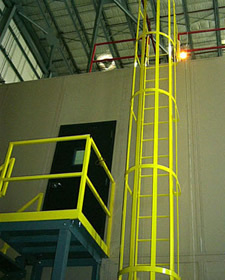 Introducing solid steel structure and a powder coated finish, cage ladders are engineered to meet OSHA specifications. Ladders feature a flared entry for easy access and include a steel base mounting bracket. All styles include an integral kick plate for added safety. Our highly trained designers will take the measurements of your space, and assure you get the most possible storage. Simple or complex solutions for all Mezzanines and shelving, including sophisticated multi-level and modular applications.